Sandwatch in Cuba is coordinated by the Coordinator of the UNESCO Associated Schools Project (ASP) network and schools from all over Cuba have been involved in Sandwatch activities. Two hundred years after the foundation of the Villa Fulgencio de Gibara, a group of students walk along its coasts, accompanied by children of all ages, by young people, and the elderly and by many other citizens. What are they doing? What is so interesting to them? Who are the organisers? If we look closely we see they are the same people who last night were enjoying a cultural activity by the sea, and in the afternoon participated in a beach sporting event between two schools. They are the same people who worked with specialists on environmental protection, conservation and sustainable use of beaches and marine resources, who together with the artisans of the Fund for Cultural Assets, trained a group of girls and boys excited to make the beach become the most beloved and protected place in the community, as well as the centre of all the cultural, sporting, recreational and scientific activity. 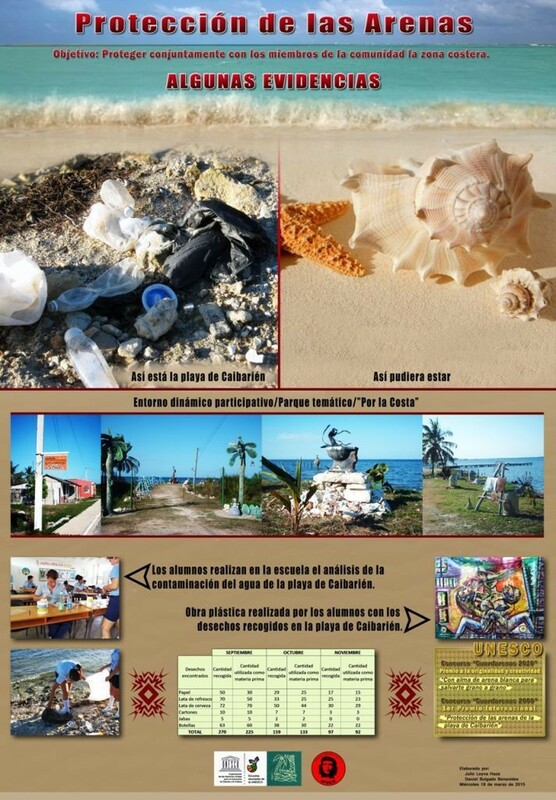 The research project "Sandwatch" of the Pre-university Vocational Institute of Exact Sciences (IPVCE) "José Martí Pérez" of Holguín, a UNESCO Associated School, is characterized by a comprehensive work programme that is not limited to the cleaning and beautifying of the beach. Instead the project involves all community groups: schools; work centres; social and artistic organizations; athletes; artisans; and scientists; to undertake actions that enable them to coexist with the environment, build scientific knowledge, and take advantage of the beach resources while at the same time conserving and protecting them. The members of the "Sandwatch" project of the IPVCE "José Martí Pérez" of Holguín have as their guide the phrase "We are not a group to clean beaches, we are a brigade to clean conscience". The group has become a valuable assistant to the scientific institutions in the monitoring of the beaches because they are able to measure the profile of the beach, its width, length, sand composition, stability and risk of erosion; flora and fauna; water quality, temperature, salinity, acidity and alkalinity, dissolved oxygen, biochemical oxygen demand, phosphates, nitrates, coliform bacteria, turbidity; wave characteristics, height and period of the waves; direction and wind speed; amount and origin of beach litter. The project "Sandwatch" has become a facilitator of actions of all kinds, from artistic and literary competitions, sports and recreational activities, scientific work, awareness raising to make each beach in the Bay of Gibara beautiful, used by the community and protected and studied for the benefit of all. A place where neighbours value each grain of sand as part of a common effort to conserve the natural riches of this zone between the sea and the land where sand, sea, beauty and benefit shake hands. Fernando Doimeadios Cuenca, Sandwatch Project Coordinator, IPVCE "José Martí Pérez" Holguín Province, Cuba. A doscientos años de la fundación de la Villa Fulgencio de Gibara un grupo de estudiantes recorren sus costas, se hacen acompañar por niños de todas las edades, por jóvenes, por ancianos y por gran cantidad de pobladores ¿Qué hacen? ¿A qué se dedican, qué resulta de gran interés para todos? ¿Quiénes son los que convocan que reciben tanto apoyo? Si miramos bien son los mismos que anoche que estaban dirigiendo una actividad cultural junto a las aguas del mar, los que por la tarde desarrollaron un encuentro deportivo en las arenas con dos escuelas de la comunidad, los que coordinaron con especialistas para el desarrollo de un ciclo de conferencias con los vecinos sobre protección, conservación y uso sostenible de las playas y los recursos marinos, los que junto a los artesanos del Fondo de Bienes Culturales desarrollaron un taller para lograr el aprovechamiento de los recursos que depositan las olas sobre las arenas, un grupo de muchachas y muchachos entusiasmados en lograr que la playa se convierta en el lugar más importante de la comunidad, que sea el centro de toda la actividad cultural, deportiva, recreativa y científica de la zona y que al ser el lugar más querido, también sea el más protegido. El grupo se ha convertido en un valioso auxiliar para las instituciones científicas en el monitoreo de las playas pues son capaces de medir el perfil de la playa, su ancho, parámetros de sus límites, suavidad de las arenas y su composición, determinar las defensas contra la acción del mar, flora y fauna, iluminación, temperatura, salinidad, acidez y alcalinidad, oxígeno disuelto, demanda bioquímica del oxígeno, fosfatos, nitratos, bacterias coliformes, turbidez, altura y período de las olas, dirección y velocidad del viento, tamaño de los granos de arena y su origen, clasificación y origen de los residuos depositados, riesgo de depresión y erosión. El proyecto “Arenas” se ha convertido en un facilitador de acciones de todo tipo, desde concursos artísticos y literarios, actividades deportivas y recreativas, trabajo científico, llamado de atención y labor común para lograr hacer de cada playa de la bahía de Gibara un lugar bello, útil, querido y a la vez organizado, protegido, estudiado donde cada vecino pone su granito de arena en la inmensa obra común de conservar las riquezas naturales de esta porción límite de agua y tierra, de arena y mar donde la belleza y la utilidad se dan la mano. A Sandwatch tool kit that contains the basic print and digital guidelines, innovative pedadogical methods, classroom and practical work, group reflection workshops and research work has been developed by the Vocational Pre-university Institute of Exact Sciences (IPVCE) Ernesto Guevara. Santa Clara. Villa Clara. Sandwatch students have communicated the results of their findings to beach users, coastal communities and decision makers and their concrete results are contributing to changes being made in the laws and regulations especially as regards invasive species such as lionfish. Since the start of Sandwatch in 2001, Cuba has participated in the Sandwatch project involving the UNESCO Associated Schools Project network (ASPnet) in all Sandwatch activities. The work became easier when the first version of the Sandwatch manual, “Introduccion a Guardarenas, una herramienta educative para el desarollo sustenable” was published in Spanish in 2007 and revised in 2012 with “Guardarenas: Adaptarse al cambio climatico y educar para el desarrollo sostenible”. Cuba submitted 11 entries to the Sandwatch Community Competition in 2005, more than any other country, and three of the entries won prizes. In particular the combined entry from Escuela Especial Dora Alonso, Vocacional de Arte Dominica del Amo, and Secundaria Básica José Echeverría, Cuba, where students of varying ages, including those with special needs, worked together to address beach contamination and raise awareness within the community, winning a special award.